Power Steering Racks Specialist, repair leak, reconditioned, fluid replacement, Essex. To fix these issues the steering system need to be checked on regular intervals, Ultimate Power Steering recommend's that the system is inspected by your mechanic at each service. We also recommend that the Power Steering Fluid be replaced at least every 30,000miles or 2 Years this will insure that the system functions correctly for as long as possible this will save you money. Manual Steering Racks are sometimes referred to as Rack and Pinion steering racks, this is because the steering unit consists of a main rack shaft with a small pinion. The pinion shaft is attached to the vehicles steering wheel via linkages, the pinion inside the steering rack has small teeth, that mesh into teeth on the main rack shaft. This converts the steering wheel rotation into lateral movement that then moves the road wheels to steer the vehicle as you drive. This system requires fewer linkage parts resulting in substantial weight savings and is very popular with most manufactures today. 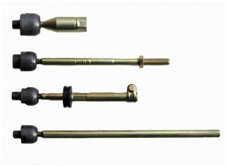 The most common problems with most manual steering racks are wear and tear on the unit. As the steering rack is out of sight and out of mind the manual steering rack is generally not looked at until it has major issues. Issues like free-play due to worn main shaft bush or free-play in the inner rack ends due to misuse, excessive use or lack of maintenance on the vehicle. The photos below are a badly rusted Toyota Hilux Power Sterring Rack Shaft. Other problems with steering racks are wear and tear on the rack shaft and pinion teeth area. As the steering rack is out of sight and out of mind the steering rack is generally not looked at until it has major issues. Issues like free-play due to worn teeth areas or free-play in the inner rack ends due to misuse, excessive use or lack of maintenance on the vehicle. In the cases of worn teeth areas the only way to rectify this is to replace the hard parts i.e. the main rack shaft and the pinion, this is very costly, so to help save your money we recommend that your steering system is inspected by your mechanic at each service, this preventive maintenance will insure that the system functions correctly for as long as possible and this will save you money in the long run.